The Webster University Men’s Soccer Team’s attacking line is a partnership 4,659 miles in the making. Starting freshman forward Dzani Delic and starting sophomore creative midfielder Dino Music trace their heritage back to Bosnia like an estimated 70,000 others in St. Louis. Their families relocated from Sarajevo and Bijeljina, respectively, to escape the war in Bosnia. Both Delic and Music were born in Berlin, but neither lived there for more than five years before the permanent move to St. Louis. Music left Germany with his family when he was five years old, Delic when he was two. In both instances, they followed family members to St. Louis. Music had an uncle who helped his father find work while Delic’s grandparents were already living in St. Louis. “We moved to St. Louis to start a better life,” Music said. Both Delic and Music played soccer, just as their fathers had in Bosnia. Music, however, did not play soccer until he was in eighth grade. Instead he played basketball, but he has since traded in sneakers for cleats. “My dad kept kind of pushing me, and all of my friends played soccer — it was just a switch, and it kind of worked out,” Music said. The Delic family has a satellite package so they can watch all of the big soccer games. Delic’s favorite player is Cristiano Ronaldo, the Portuguese superstar. But he was not overly upset when Portugal was eliminated from this year’s World Cup; he had home ties on his mind. “[I was] more upset about Bosnia,” Delic said with a dry laugh. 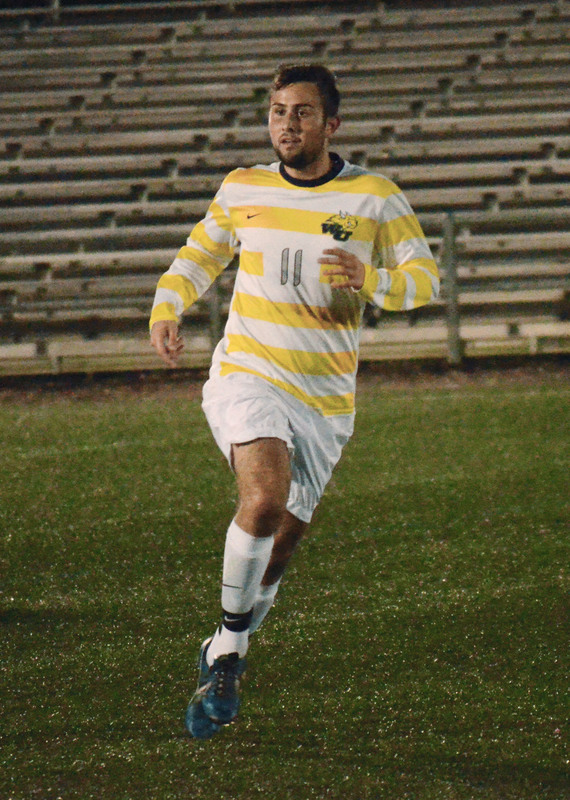 One person who was not upset with the World Cup; was sophomore Nermin Hajrizi, the third member of Webster’s new-look attack. He transferred to Webster this year after a year at William Woods University. Hajrizi was born in Germany and still visits his father, who lives in Bavaria. As a child, he would often go and watch Bayern Munich practice outside of the Allianz Arena. Hajrizi is fluent in English, German and Bosnian. He learned Bosnian thanks to lessons from his grandfather when he was six years old. Hajrizi met both Delic and Music when the three played for a club team in the area and they became friends. Music said he and Delic would go over to each other’s houses nearly every day. Six years later, the three have teamed up again, this time to lead the line for the Webster men’s soccer team. Delic and Hajrizi have started at the top of the formation for Webster this season. Music plays just behind the main strikers in the creative midfield role. Delic said the chance to play with his friends helped him decide to come to Webster. Head Men’s Soccer Coach Mike Siener noticed the chemistry between Delic and Hajrizi in the dynamic plays they flashed in the first two weeks of practice. So far, both Delic and Music have hit the back of the net to equalize for Webster. 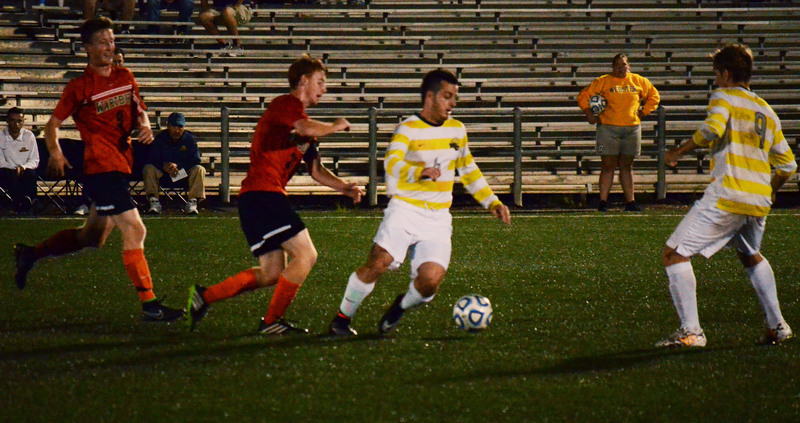 Music scored a free kick to tie the score against Rhodes College, and Delic curled a right-footed effort in to level the score in Webster’s overtime victory against the 11th ranked team in the division, Wartburg College. Though the three have apparent chemistry on and off the pitch, this is the first time since eighth grade that the trio has lined up together. Music and Hajrizi both attended Mehlville High School, while Delic went to Lindbergh High School. Hajrizi admitted there was a good amount of friendly banter between the three in high school. But he stressed it never lasted beyond the game. “After the game, you go back to someone’s house and play FIFA, or go out to eat, and it’s behind you. It’s all good,” Hajrizi said. Delic had great success playing against his old teammates during high school. As a freshman he scored a game-winning goal against Mehlville in a junior varsity game — that, according to both Music and Delic himself, was offsides. Three years later, Delic scored a hatrick against Melville and Lindbergh won 5-2. Now, all three will be attacking the same goal again. “It’s pretty exciting knowing that your friends are going to the same school as you. I played with them my whole life and it’s kind of cool getting to play with them now,” Music said.